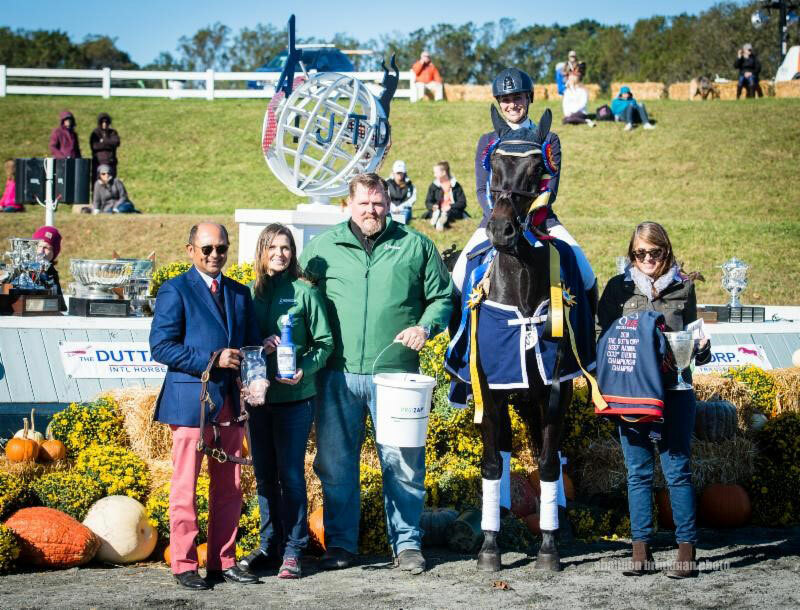 Frankie Thieriot Stutes’ trek from California to The 2018 Dutta Corp. Fair Hill International Three-Day Event proved to be worth every mile Sunday as the amateur rider was crowned The Dutta Corp./USEF CCI3* Eventing National Champion. She is joined in the winners circle by Boyd Martin who was both winner of the CCI2* and Reserve Champion of the CCI3*. The competition from start to finish with Chatwin, a 10-year-old Oldenburg owned by The Chatwin Group. They had a rail in hand, but made no use of it to finish on their dressage score of 27.3. Thieriot Stutes also received the Alexander MacKay Smith Trophy as the highest placed U.S. rider in the three-star who has not yet completed a CCI4*. Boyd Martin finished as The Dutta Corp./USEF CCI3* Eventing Reserve National Champion with Long Island T, a 12-year-old Oldenburg owned by the Long Island T Syndicate. Martin produced a double clear round for a three-phase result of 33.4. Buck Davidson and Maya Simmons’ Archie Rocks rounded out the weekend in third. The 10-year-old Thoroughbred had one rail down for a final score of 36.4. Martin also secured a win of The Dutta Corp./USEF CCI2* Eventing National Championship after a faultless clear round with On Cue. Christine Turner’s 12-year-old Selle Francais was foot perfect through every phase, finishing on her dressage score of 23.7. Martin also received the Judy E. Thayer Memorial Award as the highest placed two-star rider who currently resides in Chester County, PA.
Emily Beshear and Jennifer Eisenbrandt’s gorgeous grey Olney Uncle Sam gilded around Marc Donovan’s course, delivering a clear round to finish in second place. Beshear and the 11-year-old Trakehner close the weekend on their dressage score of 26.8. Will Faudree finished third with Michel 233, an 8-year-old Hanoverian owned by Jennifer Mosing and Sterling Silver Stables. The pair produced a lovely clear round for a three-phase score of 28.3. Charlotte Collier was presented the Amanda Warrington Memorial Trophy as the highest placed CCI3* debutant. Mia Farley received The John H. Fritz Trophy as the highest placed Young Rider in the CCI2* division. The Mid-Atlantic Horse Rescue Trophy was awarded to The Sea of Clouds Partnership’s Sea of Clouds, who was ridden by Phillip Dutton, as the highest placed American Thoroughbred. The off-track Thoroughbred also won the USEF Young Horse National Championship as the highest placed 6- or 7-year-old horse in the CCI2* . The Dutta Corp. is proud to sponsor the U.S. Equestrian Federation and is honored that the USEF has chosen to provide a Dutta Corp. flight to Thieriot Stutes as the winner of The Dutta Corp./USEF CCI3* Eventing National Championship. This year also marks the 30th anniversary of The Dutta Corp., the event’s title sponsor. The Dutta Corporation is an international and domestic horse shipping company founded by J. Tim Dutta. It has been expanding rapidly since its inception in 1988 and particularly so in the last twenty years. With state-of-the-art jet stalls and an expert team of grooms, The Dutta Corp. provides horse air transport solutions tailored to each individual horse. For further information on The Dutta Corp. Fair Hill International, please call 410-398-2111 or visit www.fairhillinternational.com.